Stéphane, could you please have a look at this bug? If open-iscsi is setting up a broken interfaces file, I think we should try to get this fixed for oneiric. This impacts the server CD. http://paste.ubuntu.com/706210/ is the /etc/network/interfaces generated by d-i. This is taken from the .img over iscsi before ever booting the system. Commenting the part about eth0 works around the issue. I'd still think "inet manual" should be considered as a similar setup and not wait 2 minutes for something to happen (which will never happen as the interface is already up and nothing needs to be done). Marking as Invalid for open-iscsi and bumping the importance for ifupdown + targeting for SRU. not reproducible with a 'manual' interface in /e/n/i without open-iscsi installed. Looks like /etc/init/iscsi-network-interface.conf is probably the culprit. I verified that the /etc/network/if-up.d/upstart script fires for both lo and eth0 (rather that just lo as it did with iscsi-network-interface in place). While we need to remove the upstart job to let the ifupdown hooks fire, we also need to be careful that in doing so, previously-working systems don't now have ifupdown reconfiguring their network interface out from under iscsi. So if we're dropping the job we need to somehow ensure on upgrade that /e/n/i gets fixed up to not have any configuration for the interface in question. Accepted open-iscsi into oneiric-proposed, the package will build now and be available in a few hours. Please test and give feedback here. See https://wiki.ubuntu.com/Testing/EnableProposed for documentation how to enable and use -proposed. Thank you in advance! 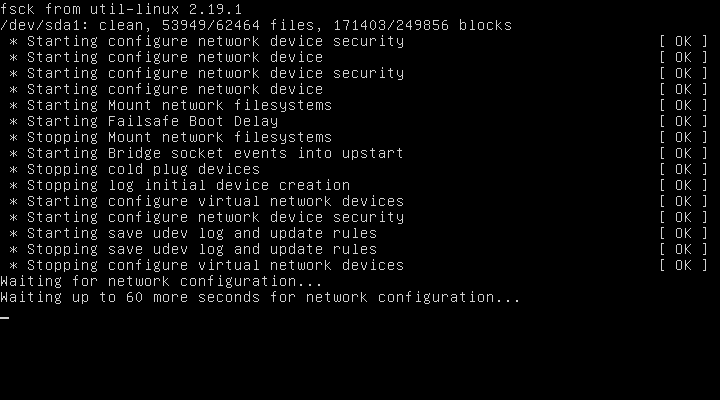 It corrects the issue for me, and nice fast boot is achieved. Network is still up and working. Thanks for testing. much appreciated. It doesn't seem to fix the problem. Oct 19 13:19:54 r60 NetworkManager: <info> (eth0): taking down device. Oct 19 13:22:04 r60 kernel: [ 307.163876] PM: Syncing filesystems ... done. Your log shows usage of NetworkManager which is incompatible with iscsi root. Network Manager on startup will try to re-establish the existing network connections, thereby killing your iscsi root in the process.